May Craft Stamper Take It Make It challenge started a week ago, but there's still plenty of time to enter. "Anything goes", as long as you use stamping somewhere on your project. If you're looking for project inspiration I suggest you have a look at the list of gorgeous colourful entries that have already been linked to the challenge. Just follow *this link*! First I stamped the image on white paper, and coloured the skin tones with my Promarers. Also the wine glas got some red on it. Then I started working on the beach chairs. I stamped the same image on a piece of red cardstock, cut out the tiny chair pieces, and glued on top of the stamped image. Then I used the marker pens again for colouring the girls' hairs. 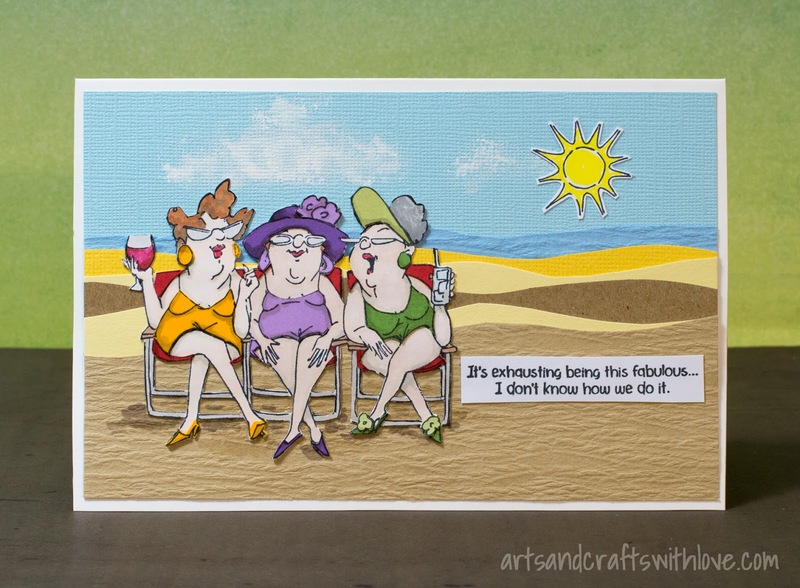 I stamped the swimsuits, earrings and hats on coloured leftover paper pieces, cut out with my crafting knife, and glued the pieces on the stamped image. Once the glue was dry I added some shadows on the swimsuits. There were many tiny pieces to cut and glue, but maybe the most challenging part was to fussy cut the entire main image. Especially the chairs had many truly detailed and thin parts! For the beach background I used pieces of brown, yellow and blue papers. Before gluing down the main image I created some white clouds on the background sky with white acrylic paint. Once the glue was dry I added some shading on the sand, again using my Promarkers. Aren't the girls just fabulous! 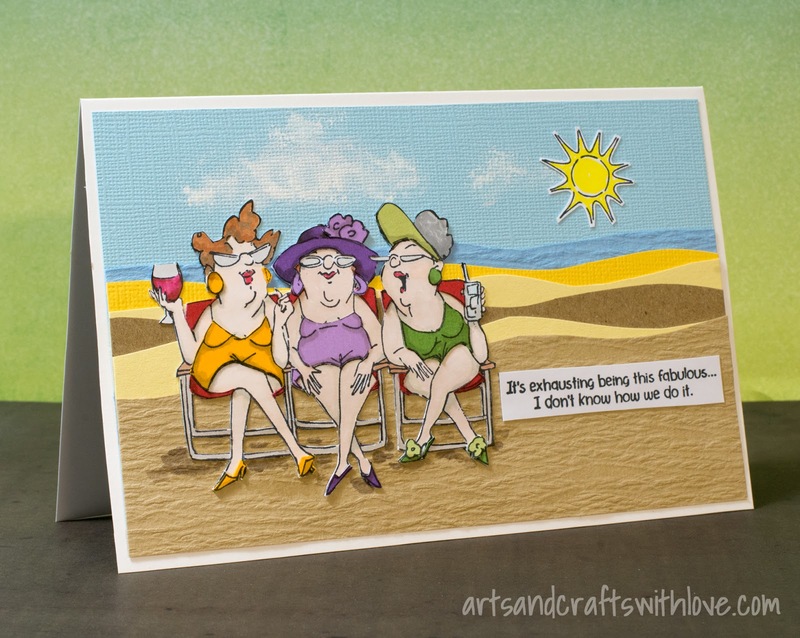 Such a fun card project to make! I wish you a wonderful weekend. Happy crafting! Thank you Carol! Wishing you a wonderful day, too!